As much as I enjoy a classic meatball simmered away in homemade tomato sauce for hours, it’s rare to find that kind of time in the day. And it’s not like gluten-free meatballs are all that available at your local grocery store . . . so that’s out. Happily these baked chicken meatballs are here to satisfy any meatball cravings in a pinch — they’re the centerpiece of a hearty, comforting meal that’s quick and easy enough to prepare any day of the week! You’ll love how quickly these meatballs come together using store-bought gluten-free bread (Udi’s) and a bunch of pantry and refrigerator staples — olive oil, dried spices, canned tomato paste, milk, Parm, you get the idea — leaving you with a very short list of fresh stuff to pick up. I’m a fan of how the combination of ground chicken thighs and pancetta ensures that the meatballs stay succulent when cooked through — and even if reheated — you don’t want to go with any leaner cuts here, trust that the results won’t be nearly as tasty! What goes into your ideal meatball? Beef, pork, veal, chicken? Dried breadcrumbs and/or fresh bread? I’d love to know — tell me in the comments! I really love these meatballs assembled into open-face sandwiches, but they work just as well atop pasta with a red sauce if that’s more your style! Leftover meatballs may be reheated directly from the refrigerator on a parchment-lined pan — about 10 minutes in a preheated 400°F oven. Preheat oven to 400°F. Line a large, rimmed sheet pan with parchment paper; set aside. In a small bowl, tear 1 of the hamburger buns into small pieces (roughly 1/2″) toss with milk until evenly coated; set aside. In a medium (about 8-10″), non-reactive pan (or pot) warm olive oil over medium heat until it shimmers. Add pancetta and cook for a couple minutes — we want it to render out some of the fat, but still remain soft, not crisp. Add onion through Kosher salt to the pan and cook, stirring often, until onions are softened and translucent. Stir in tomato paste (it’ll want to stick to the pan, that’s ok), cook, stirring constantly, for about 1 minute — it’ll be slightly caramelized. Stir in water, and deglaze pan; continue to cook until most of the liquid is evaporated. Remove from heat, and transfer mixture to a heatproof bowl to cool slightly (about 10 minutes). While pancetta mixture cools, blend ground chicken and milk-soaked bread together in a large bowl using a fork. Stir in cooled pancetta mixture and Parmesan. Divide mixture into 36 even portions (about 1-1/2 tablespoons each, a #50 cookie scoop makes this easier!) and roll into balls; arrange on prepared cookie sheet, leaving about 1/4″ space in between. Bake in preheated oven for about 40 minutes, or until browned on top and cooked through (165°F on a meat thermometer). Fix into sandwiches (below), serve however you like or cool/wrap/store in the fridge (up to 1 week) or freezer (several months) for later use. While the meatballs bake, arrange 3 remaining buns cut side up on a large, rimmed sheet pan. Top each bun half with a slice of Provolone; set aside. When meatballs are about 5 minutes away from being cooked (so at about 35 minutes in), pop sheet into oven on another rack. Bake until cheese is nice and melty and bun is toasted, about 5 minutes. 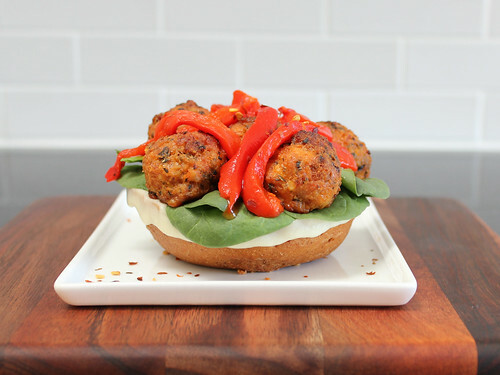 Top each bun with a small handful of spinach, 6 meatballs and some roasted pepper strips. Top with tomato sauce (or serve on the side), if desired. Serve immediately — you’ll need a fork to eat these! ¹ Udi’s gluten-free hamburger buns can be found at some Whole Foods Markets (usually in the freezer section) or Trader Joe’s, and many other locations. For store locations near you, check out their store locator. Their products are also sold online. ² You may substitute ground turkey, but please avoid ones with lots of additives (eg salt and seasonings) and the super low fat varieties!